Rhys Runciman reckons the secret to living a long and happy life is simple: a daily dose of porridge, banana and ice cream. And having just turned 102, we think he might be onto something! Rhys is a regular attendee at HBH’s Day Programme, so on Wednesday May 23rd, we held a fun-filled birthday celebration to mark his 102nd birthday. He also enjoyed a family get-together in the evening, which was ‘a great catch up’. Rhys went to school in Auckland and trained as a steam engineer, and as a family they lived and worked in Rotorua and Edgecombe before returning to Auckland. He was married to his late wife, Janice, for 68 years and says they ‘had a lot of fun’. Rhys still lives in the house they retired to 32 years ago, and says he is lucky to have a family that takes good care of him, inviting him on outings and involving him in family life. 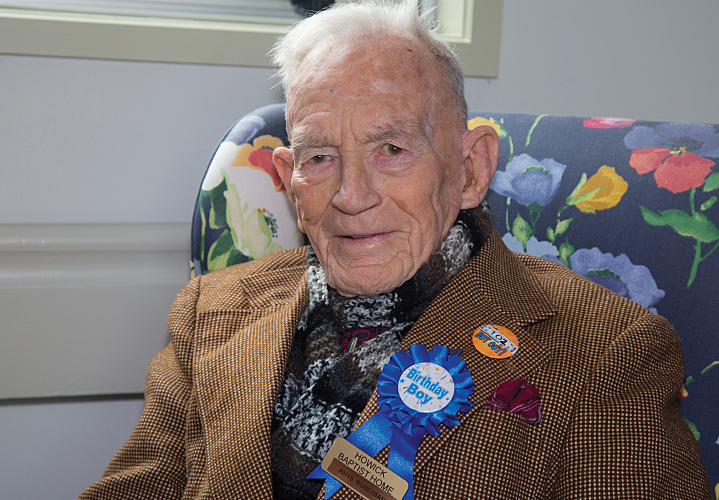 When Rhys turned 100, he received dozens of letters, not just from the Queen, but also from the Prime Minister, the Mayor and the Leader of the Opposition. Congratulations from all of us too, Rhys!